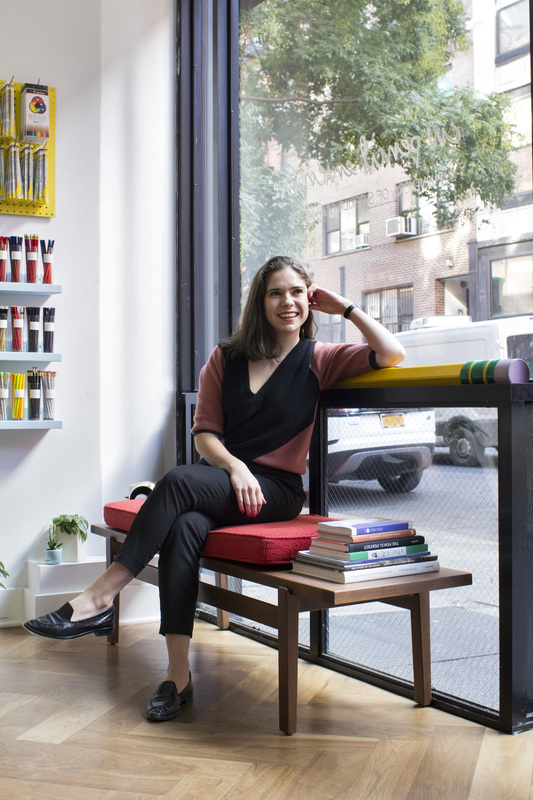 Caroline Weaver is the founder of CW Pencil Enterprise, a specialist pencil shop in New York, and is the author of The Pencil Perfect published by Gestalten in 2017. She studied Foundation Diploma in Art and Design at Central Saint Martins in 2010. I've been interested in the pencil as both a utilitarian object and a historic object for as long as I can remember. Four years ago, I took the plunge and opened a shop and it has since developed into a space to experiment and to learn about and play with pencils. When I'm in the shop, my job is to be a storyteller just as much as it is to sell pencils. There are so many family histories and design stories behind the objects and I think it’s important to share these when helping someone find their perfect pencil. In addition, I also run our online store, subscription box service and am working on a second book, which will come out with Chronicle in spring 2020. What have you been up to since leaving Central Saint Martins? I did my foundation at Central Saint Martins and then went on to do my BA in Art Practice at Goldsmiths, University of London. While there I spent most of my time making work which kind of functioned as pseudo-anthropological studies, often focusing on very specific objects and collections. After my degree I moved to New York – simply because it's my favourite city. I got a boring job while I figured out what I was actually going to do. I'd had this crazy idea to open a shop and sell pencils from all over the world for quite a while, but it was more of a fantasy than something I thought I'd actually pursue. One day I decided to just go for it and built a website, bought some inventory and it has taken off from there. As it turns out, there are a lot more people interested in the subtle nuances of the pencil that I ever anticipated. Four years later, we're in a bigger shop on the Lower East Side, starting to develop our own products and still growing. Can you tell us more about CW Pencil Enterprise – why pencils? The pencil has always been my favourite object – for its simplicity and tactility. Growing up in the US especially, the yellow #2 pencil is such an icon. I noticed that every country has its own pencil “norm”, which often isn’t distributed globally. This observation led me into a sort of tailspin of pencil collecting and the more I learned about their individual histories the more interested I became. Most pencil companies are family-owned and well over 50 years old, but what I find most interesting is that the fundamental design of the pencil has hardly changed at all since the 1800s. It's perfect as it is, and though the ability to fine-tune the manufacturing process has changed since then, little else has. It's my job to convince people that the pencil is an object worth using and worth noticing. It smells like something, feels like something and its function is simple. Most people have forgotten what it's like to write with a really good pencil and I'm here to remind them. Why did you want to study at Central Saint Martins? I grew up in rural Ohio and quite frankly, I wanted to go to the best art college I could, as far away as possible. I was initially drawn to Central Saint Martins because I thought I wanted to study womenswear, but I quickly realised within the first week that my interest in objects extended far beyond what can be worn on the body. How would you describe your experience on the foundation course and how did it encourage the way you work now? My time on the foundation course was unexplainably wonderful. I was in a new country, where I knew no one and was could just dive in and explore every aspect of my new life and new city. I chose the sculpture pathway and had the best tutors (Pierpaolo Inga and Adrian Scrivener) and the best classmates – all of whom encouraged me to work in a way that was outside of how I was used to thinking. I worked harder but also felt freer than I ever had. Some of my best friends, even 9 years later and in another country, are people I met on the foundation course. It really set the tone for the rest of my education and for the decisions I made later on – even starting this crazy little business. I often say that I went to art college not necessarily because I wanted to be an artist but because I wanted to understand that language. It was my year at Central Saint Martins that launched me into that way of thinking and into an obsessiveness with objects and their histories which still plays an enormous part in my career and my life. What words of advice would you give to a student studying on the Foundation Diploma in Art and Design? The best advice I can give is to just make as much as you can make, see as much as you can see and use your journal or sketchbook to write down everything. The most important thing I've learned in the past 9 years is to trust your gut instinct and not be afraid to take risks.